Of course I miss you, it would be stupid to think that I didn’t. A couple of years together thrown away a puff of anger, hurt feelings and faux outrage. Because we are both proud people and although we were both in the wrong, our pride doesn’t allow us to apologise and climb down from our moral high ground very easily. I know that I upset you, you know that you upset me, but is worth throwing away a bright future for the sake of some relatively petty issues? So why are we allowing this to continue to fester and the distance between us to grow? I’ve already said sorry. I don’t think I can do anything more. Chrissie Hynde surveyed the room before her, a sell-out of 3000 souls all seated expectantly in the Glasgow Royal Concert hall. “It’s not the Barralands, is it?” She quipped before bursting into her first song Alone, the title track from her new album. John and I have worked together a few times over the years. The first time was back in 1998 during the halcyon days of deregulation when the government was throwing money at the utility companies in an attempt to open the energy and telecom markets and make buying electricity, gas or telephone services more competitive. That was the party-line anyway but the real reason was in making money for the people who already had the money to invest, i.e. the Tory Party demographic and the banks, pension companies and institutes which could make huge profits buying the UK infrastructure at bottom-dollar prices and their share prices doubling over night. As individuals working in software development, there was lots of money to be made on that gravy train and even although John and I were comparative bottom-feeders, we still made a relative fortune on obscene hourly rates, but that’s supply and demand for you. Deadlines were tight, the date at which the market was set to open was fixed in stone and our employer Scottish Power was desperate to be one of the first PES’s with its foot in the door and it’s grubby little hands in your wallet. Of course the reason that deadlines were tight was because the early days of analysis and design had been undertaken by some of the major consultancies of the time, IBM,. Logica, Cap Gemini and they were too busy lining their own pockets with the freely available money directed from the public purse to actually give a t0ss about getting the job done. They talked a good game, as they always do, the project managers and analysts were the kind of guys who were good at drawing boxes to represent systems or data sources and then drawing the lines between them to represent processes and data flows. You know the type, all talk, all confidence and delivered nothing. I hear on the grape-vine that these guys are still out there now, 20 years later working in banking and the privatisation of Scottish Water, the latest gravy train to come along offering free money to those who talk a good game. It’s not really strange to find that these guys all know each other, a cabal of frauds masquerading as leaders when all they are good at is leading any unsuspecting PLC up the proverbial garden path. Of course by that time, budgets have been agreed and half spent, lots of documents have been produced with diagrams of boxes and lines but not a lot of actual detail and no infrastructure or software architecture which will implement the new business requirements. That’s when they call us bottom-feeders in, the mercenaries who drift from contract to contract getting the work done on a decent daily rate extending the contract as long as we can to keep the dosh rolling in as long as possible or until someone else makes us a better offer. 1998 and Scottish Power went live with half-@rsed systems that didn’t work, that had been badly designed and sparsely data-populated. Let me elaborate, some @rsehole who will remain nameless had been so focused on the data flows to communicate customer comings and goings with other market participants that he had completely missed any changes to the customer service screen to deal with the new data flows and the changes. Another @rsehole in charge of data population decided that half the customers weren’t in scope for initial population. So on day-1 when these customers decided to get their electricity elsewhere, their data content fell down the cracks between the systems never to be seen again. Yeah, of course it caused a stushie, there were customer complaints, OFGEN were involved, but the consultancies didn’t care, the @rseholes didn’t care and the bottom-feeders like John and I aren’t weren’t paid enough to care. If the truth be told, what John and I did, with most of the development team was party hard on the money we earned on the gravy train that seemed that it was never going to end. Every time our contract was renewed there was another £200 per week thrown on the deal, a sweetener to keep us motived and interested, sticking with the project to get it over the finish line even although we knew that it was fecked. We were paid to fix the bad software, write the missing parts and cleanse the data, all of which should have been complete before the system went live. Here’s a unobvious truth, a software developer will earn more money from a bad project than a good one and I can assure that we made a fortune. There were quite a few marriages ended in that period. But that’s another story for another day. He struts acros the stage, posing arrogantly, sneering then staring at the audience, provocatively inviting them to challenge his machismo. At times, he almost whispers then roars or screams through their reportoire of classic Doors anthems, Riders On The Storm, Break On Through To The Other Side, Hello I Love You. He looks like Jim Morrison, if thats possible, tall, slim, great cheekbones and those wild flowing locks, bedecked in black leather jeans and cheese-cloth shirt. The women seems to love his strutting and I’m jealous, I’m sure I’m not the only one. For the instrumental section of Light My Fire, he goes off stage, having the good grace to let the band take the credit. The whirling organ and hynotic bass are still playing around in my head today, much better than the bland covers by the likes of Sinatra. The band are just as authentic, the keyboard player even looks like Ray Manzerak and just as virtuoso on his hammond organ. As a long term piano player, I particularly appreciate his artistry. My mate Ian is just as enthusiastic about the guitarist abbilities. The band roll out all the classic and a few album tracks that I’m sure I must own including Spanish Caravan that I had forgotten. What an an atmosphere and the enthusiastic crowd weren’t slow to show their appreciation. I first saw The Doors Alive at the O2 Academy in Glasgow about 10 years ago, somehow they haven’t changed, they’ve got better and seem younger .. can’t figure why! If you’re in Edinburgh tonight, go see them, I guarantee a treat. Day 1 of my favourite or meaningful music from the 80s as nominated by my friend Alan. 80s music is largely forgettable pop rubbish, but there are some real gems in there, but I’ll get to those later. But first and somewhat controversially as I’m a huge fan of his earlier work. David Bowie’s Lets Dance was the end of an era where he went from rock to pop and chasing commercial success. Shortly after the album was released, I went to see him play Murrayfield in August 1983 and it was a fantastic concert. 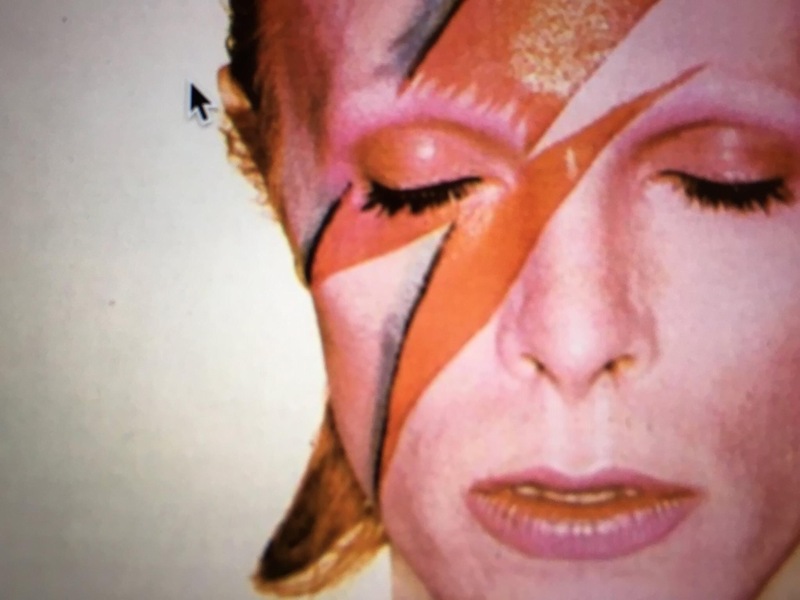 A good mix of the new and classic Bowie songs. I’m still a fan, always will be, the Bowie tribute I regularly go to see are fantastic. They were in great form last night at The Hard Rock Cafe, Glasgow. But Bowies next album Tonight released 1984 with the cringeable Loving The Alien was the end for me until the reality tour in 2003. Sunday evening and I’m on the .. What’s the opposite of red-eye? .. Flight from Glasgow to London. I’ve had a lovely weekend, the right balance of family and friends, a curry and a few beers with friends on Friday, a day with family yesterday. my kids for dinner this afternoon. Who needs to be heading south at this time on a Sunday to start work at 9am on Monday? I resent that flying down to London for work on a Sunday evening significantly eats into my personal time. It’s one thing working for a living but I think that work should be kept in perspective and ones real life is always much more important. Having a look around the passengers, most are travelling for business, commuting on the Sunday evening to avoid the Monday morning madness of the red-eye flight and then rushing across the city trying to get into the office at a reasonable time. It’s just not worth the hassle. But sitting here onboard a flight at 7pm on a Sunday evening, away from family and the thought of living out of a suitcase for the week, it dawns on me that this isn’t worth it either. But never leave a situation with a problem, always consider the options and the solution. Option 1 – Maintain the status quo, carry on regardless. Option 2 – Go back to working in Edinburgh and travelling 3 to 4 hours per day. Option 3 – Take a job in Glasgow even if it’s not ideal, but be thankful with a commute of only an hour per day. Real life is always much more important than work. 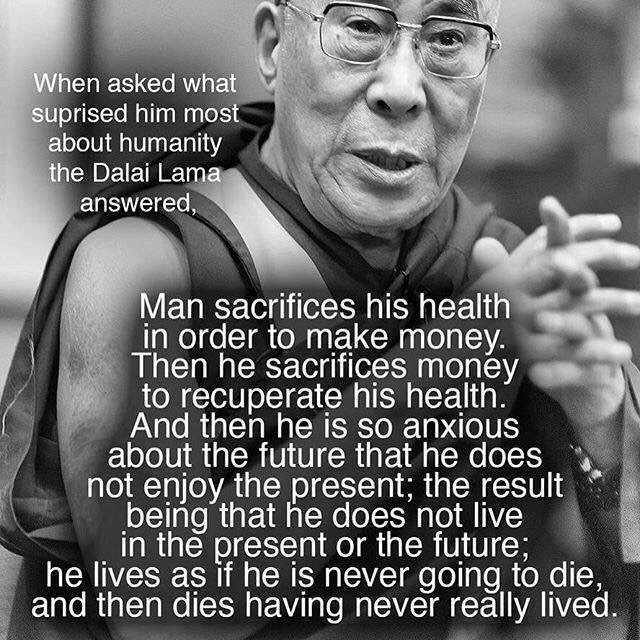 The quote above from the Dalia Lama shows he had it sussed!